I created this app because I always wanted to create an open source application. But I never had an idea on what to do. 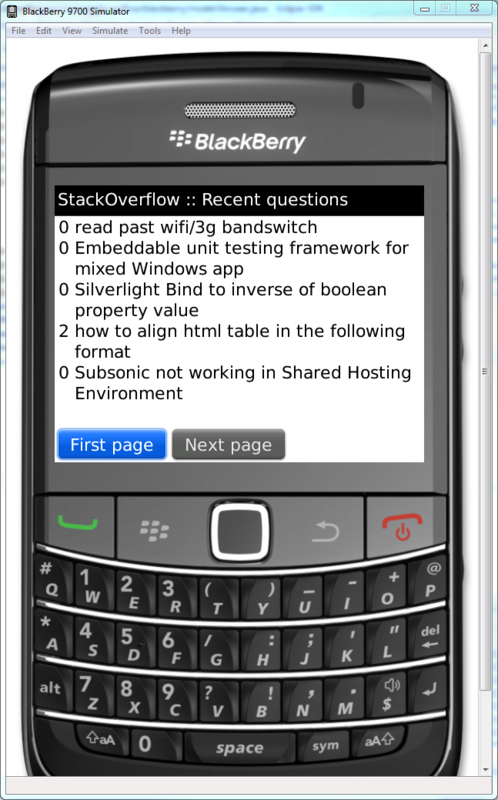 So I used my skill in BlackBerry development to build an app with the API provided by StackOverflow. You can get the source code on Google Code, and compile it yourself with BlackBerry plugin. BlackBerry OS 5.0 I will try to make it for 4.5+, but since RIM is trying to push OS 5.0 on all devices, I may not do it. It is still in an alpha stage of development. I don't have much time this summer to finish this application. I will try to do my best to add code every week or two. If people are interested in helping, post your information on the Google Code page. If people have logo, Application name idea, they are welcome. This is the first time I show my code online, and I will apreciate any helpful comments on my work. If you find out that my english is not well written, this is because it is not my first language, feel free to correct me. The first version of the app was built during the close beta, but I never had the time to post on the other website for the beta. It is now supporting the 3 websites. Am a good java developer, develop in rails and other languages. I dnt mind helping out:D However I want to advice Github as its a good version control system. The application does not work, or at least I cannot install it. I can get the jar file, but the phone gives errors on install. I tried to get the cod files in a different way and install the app offline, but I failed. Is this application valid for Blackberry Curve 8520 OS 5? Not the answer you're looking for? Browse other questions tagged app obsolete .